“Only two species of marine turtles display a unique mass nesting behavior. This behavior is known as an ‘arribada’. This reproductive phenomenon was first observed by the scientific community in 1961. By producing large numbers of offspring most organisms like sea turtles can insure their survival even after predation occurs. As they evolved, ridley sea turtles adopted a unique nesting behavior that increases their offspring’s chance of survival. They deposit more eggs in the sand than predators can consume. No other species of marine turtle uses this type of nesting behavior. Both species of ridley practice the phenomenon known as “predator swamping”. “Predator swamping” can also be observed as hatchlings emerge from their nests in large numbers. This behavior overwhelms the predators that wait to eat them on the beach. Predator swamping increases the odds of offspring surviving to adulthood and introduce that parent’s genetic information into the gene pool.” http://www.seaturtleinc.org/education/lesson-plans/arribada/. See pics below from our time in Ostional at the turtle presentation, and then at a beach clean-up that everyone participated in until dark, which ended after a thunder and lightning rainstorm rolled in. We unfortunately were not able to see any turtles nesting this evening, due to the storm, during which no one is allowed on the beach, for good reason! Only 5 turtles had nested the prior night. Locals were predicting the next arribada at around the 15th of August. 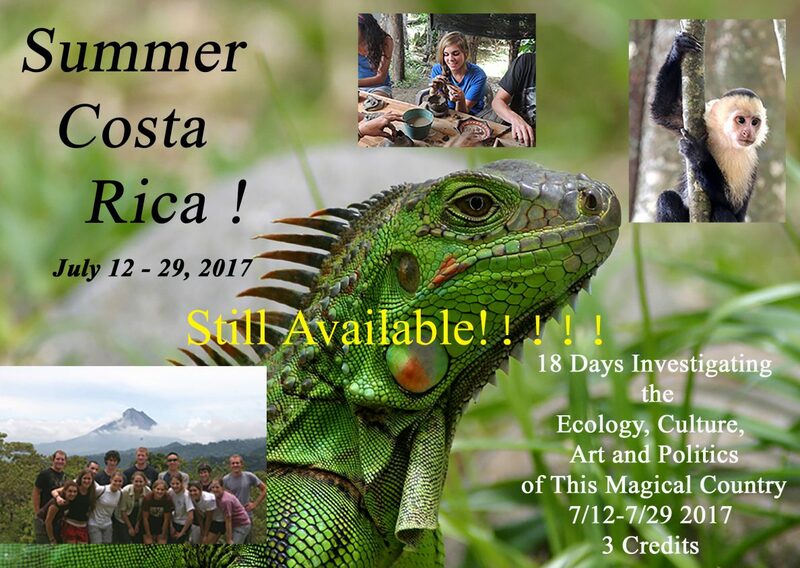 The good news is that we got to see Green turtles nesting in Tortuguero on the Caribbean coast, so course participants experienced this very special event for which Costa Rica is well-known.